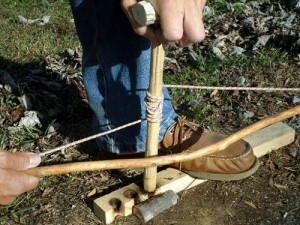 I was first introduced to the Egyptian Bow Drill about 12 years ago from an article at primitiveways.com. It wasn’t until recently that I decided to try it out for myself. The main difference between the Egyptian Bow Drill and a conventional bow drill is that a knot is tied around the spindle thus capturing it with two main benefits: the spindle (especially short ones) cannot fly off the hearth board and become airborne; less tension and friction is required for the cord to turn the spindle. 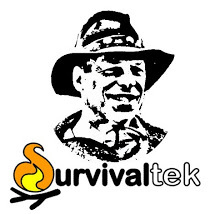 This is particularly helpful when weaker natural fiber cordage or improvised cordage is used. Typically a clove hitch is used to fasten the cord in the center of the spindle, with the lines being coiled around the spindle on each side of the knot (see photo). About 3 turns per coil worked best for me to draw a full stroke in each direction. The net effect is that while one side unwinds, the opposite side rewinds and the process is reversed with each stroke of the bow. I found that a slight angle to the bow was needed to compensate for the span of wrapped cordage in order to maintain a smooth stroke and rhythm. For me, I prefer the conventional bow drill with a taught line, but for weaker cords that are more loose or can’t take the strain, the Egyptian Bow Drill is a good way to go. This entry was tagged Bow Drill, Egyptian Bow Drill, Fire, Firecraft, Friction, Spindle. Bookmark the permalink.